In 1825, a group of ladies, including Miss Oswald of Scotstown, founded what became known as the Glasgow Protestant Institution for Orphan and Destitute Girls. Its object was to train orphan and destitute girls to be 'active and acceptable domestic servants, and so be able to earn for themselves and honest independent livelihood. The following year, the ladies obtained suitable premises and appointed a competent matron and teacher to instruct the girls in reading, writing, arithmetic, sewing and household work. Over the years, the establishment occupied premises at a number of different locations including Woodside Road, then several years at 23 William Street, Greenhead, followed by a considerable period at Slatefield House, 707 Gallowgate. By 1863, it was based at 7 York Street, Little Govan; this property was later redesignated at 339 South York Street, a thoroughfare now known as Moffat Street. The York Street premises could accommodate up to 40 girls aged from 5 years upwards. IN 1863, a charge of £8 a year was made for each inmate, or £6 if her clothing was provided by her patron. It was reckoned that the true cost of maintaining each girl was £10 a year, the shortfall being made up by donations. 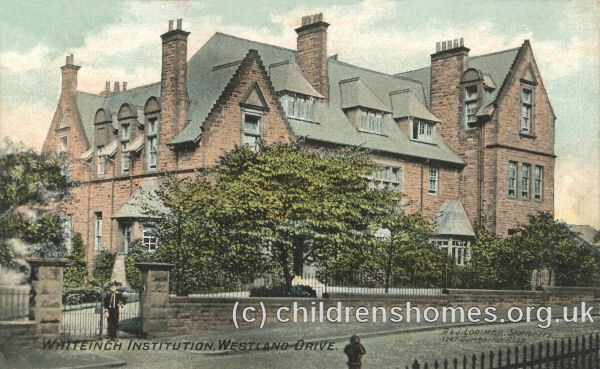 In 1892, the institution finally moved to purpose-built premises at 21 Westland Drive, Whiteinch. The building was designed by Stewart Henbest Capper. By the 1940s, the establishment was known as the Westercraigs Hostel for Girls. In the 1950s, it became the Elmbank Hostel, now housing young men, some of whom worked in the Clyde shipyards. In more recent times, the building has moved into private residential use.